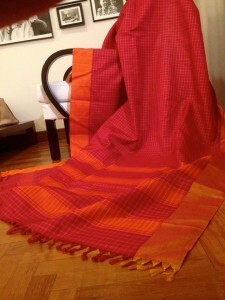 kanjeevaram silks are known for their combinations… the body and border clash and contrast. usually its about the colours. their richness, that depth that you can’t quite catch and explain in mere words. 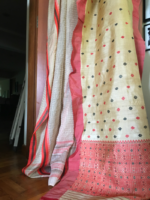 this one’s combination had me standing rapt before the shelf at ambara, this lovely boutique right by my friend’s place in bangalore. a wise decision, aaargh, was taken. i would take this saree home and mull over it. apparently i had a will to be not impulsive. well, haven’t worked (read earned) for almost eight months, this unusual move might have something to do with that; though my heart was already bizarre magenta and shot blue/green. the manager of the boutique was sweet, do take it, she said. she and my friend know each other. in fact, ambara stocks this wonderful red oil, roots and shoots, that my friend’s mother gets made at home, so good for the hair. anyway, the lady said she’d drop in later and collect some oil. we got talking when she came by. for some reason, she seemed interested in finding out more about me. where had i lived before moving to singapore? when had i got married? oh really, i’d spent three years in jamshedpur? my husband worked for that gentleman? guess what, she grew up in jamshedpur. her mother taught in a convent school there. they were three sisters… of course, she knew everyone practically that i’d met there. i was sort of surprised. jamshedpur is this small company town in bihar, now that area is in the new state of jharkhand; to find someone from there here, right next door at that… and to be exchanging teehees about my husband’s terrifically handsome first boss and other not so interesting things about jampot… it was unusual, but yeah, can happen. 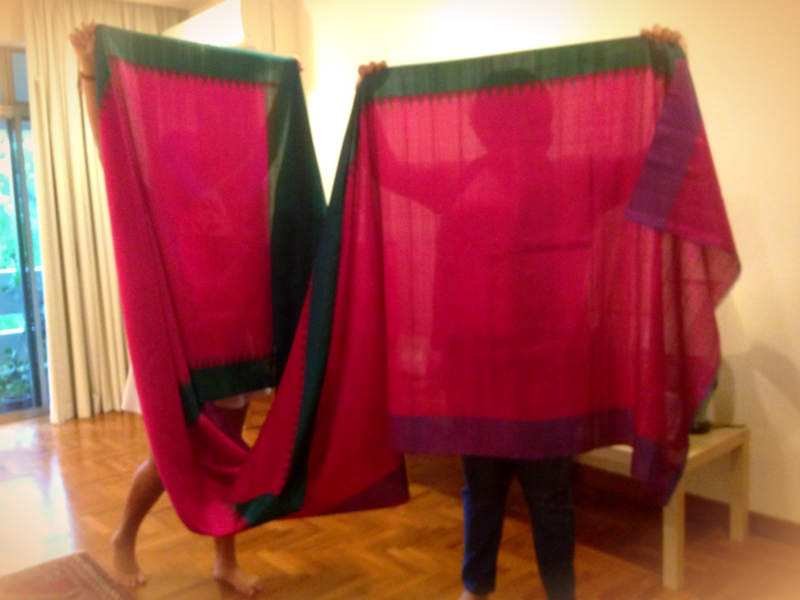 by then my friend and i had almost convinced ourselves that the saree would be returned. we are into lots of restraint and reason here you see. i mean, it’s pretty, we said, but is it worth the price? couldn’t the silk have been thicker? 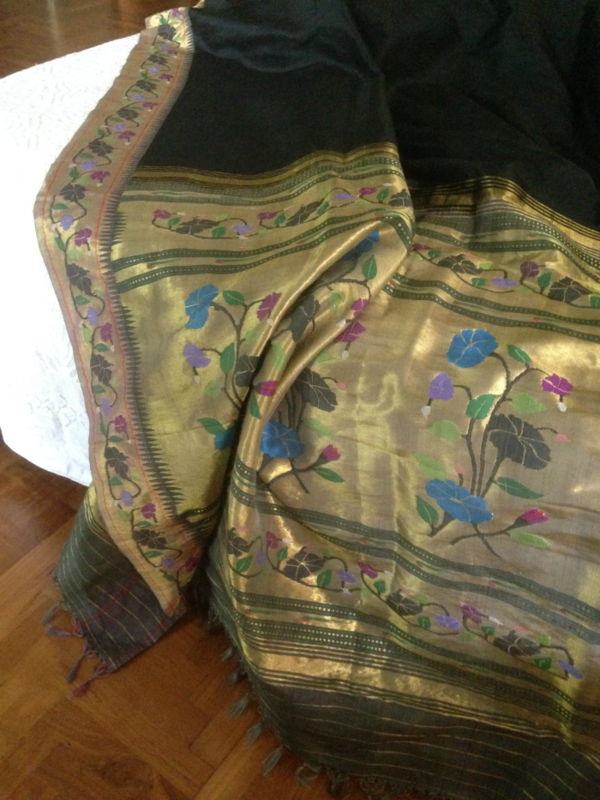 and come on, indi, you have lots of such sarees. well, i don’t. but i was building character. the lady wanted to know more about me. where was i before jamshedpur? and before that? i was again slightly surprised but said, well, delhi… assam. oh, a very small company town… you mayn’t have heard of it, i mumbled. what? the lady’s eyes gleamed. my sister, she said, worked there. she was a secretary to some senior officer out there. i was looking at her suddenly speechless, which is totally unheard of for me. her sister worked there? secretary? i suddenly felt i knew that surname. a memory seemed to leap up and pass running before i could catch it. did she know this officer’s name? 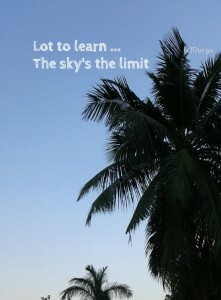 no, she didn’t, but her sister was in duliajan for a number of years. i called my brother, he said the name was familiar. we told the lady, sorry but we wouldn’t be taking the saree. she was most understanding. 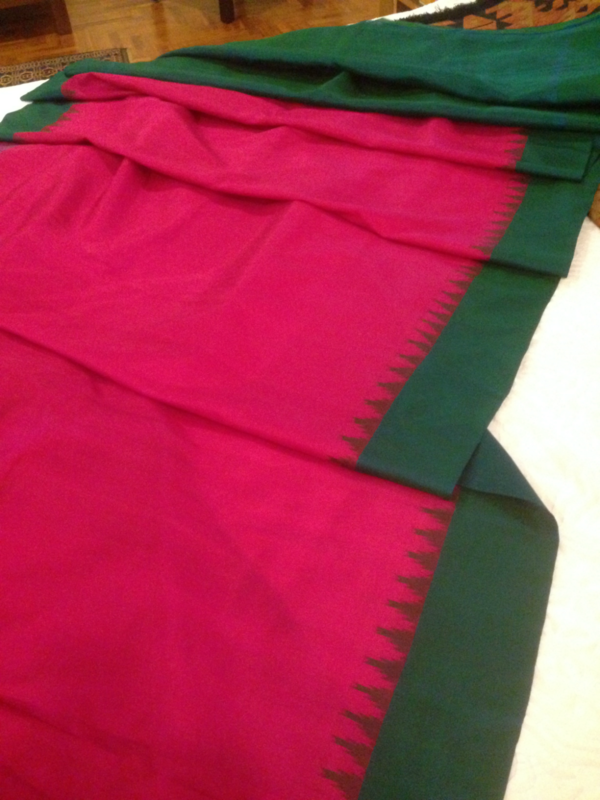 a couple of days later, fed up with my resilience, i ran and got the saree of course. day before got a whatsapp message from my friend: yeah, the lady’s sister was your father’s secretary. she remembers you as …. my pet name. here’s her phone number. she was there the day your father passed away. i am not good with maths, i can’t calculate probability. but i can tell you this saree has a really rich combination and these six yards wrap much in them, might be hard to ever find the right words to explain. the colours and tone are inordinately complex and beautiful. dying to wear it now. 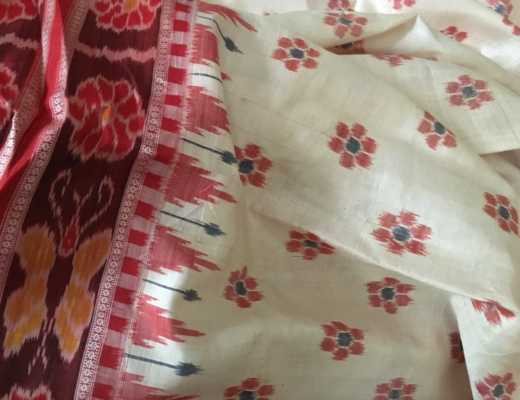 I am pretty sure my mother has the exact same print and color combination in a minutely different shade..
i hope she has a wonderful time wearing it… sarees are special creatures. thanks for my first comment on our very own website. here’s to writersbrew. 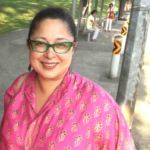 hi ritu, yeah, you total freud, sir… teehee. It’s a small world or The world goes round; wonder which one fits in here. That’s an interesting tale of the lady and your history. Now how often does one meet such people, quite rare I guess. That’s a wonderful combo, colours quite rich. Trying to imagine you draped in those colours. 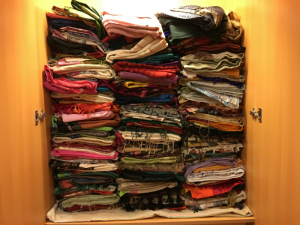 🙂 Me no saree enthusiast (must be a case of ‘Too much of a thing brings down it’s likeability’) But with two marriages in the family coming up this year, looks like I will be soon joining the gang of saree shoppers from my family. yay, saree shopping. 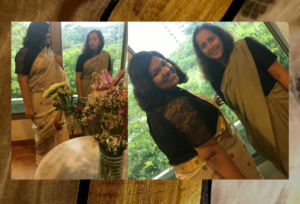 you know for almost 13 years, from around 1990 to 2002/3, i hardly wore sarees, deciding i was too fat, they showed tyres, etc., went around in my tents ha ha… then after my girl was born, can’t remember the exact year, i discovered many of my sarees were torn as i hadn’t worn them and they lay not opened nor aired. 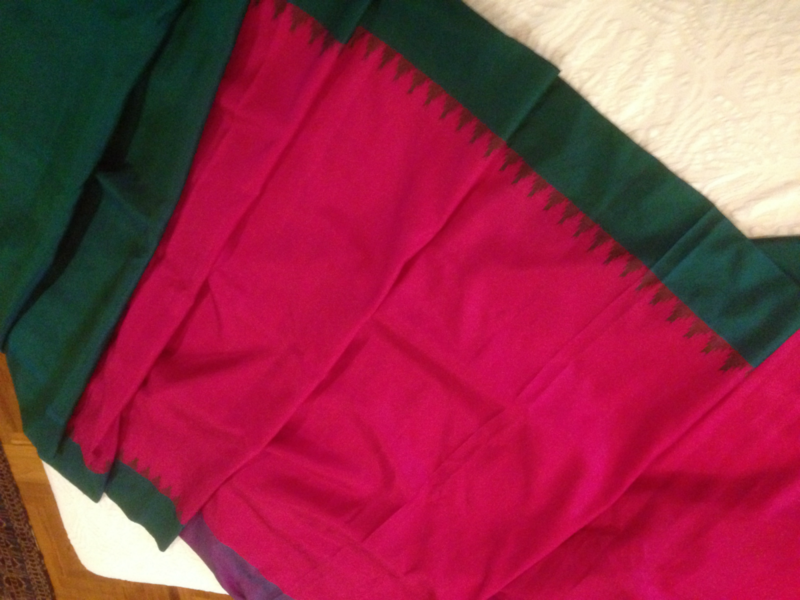 broke my heart… went back to looking at and buying sarees. even wearing them. when i discovered she was indeed my dad’s secretary, the funniest of feelings. like he came and spoke to to me. 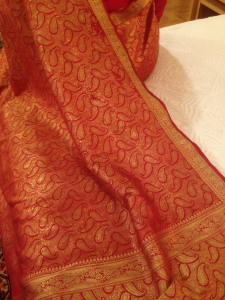 yeah, the saree is super pretty. enjoy your shaadis.